Vitamin B12 is a water soluble vitamin which plays an important role in the functioning of the brain and nervous system, and in the formation of the red blood cells. It is naturally present in some of the foods. The human body is able to store enough b12 to last several years, hence a nutritional deficiency is very rare. A class of chemically related compounds is called vitamin B12, because they exhibit some vitamin activity. Structurally the most complicated vitamin, it contains a small amount of cobalt, hence is referred to as Cobalamin. The B12 attaches itself to the protein and is liberated during the digestion. 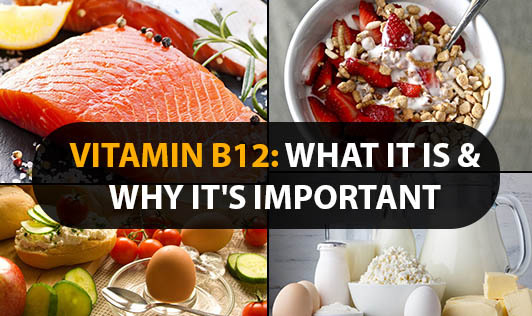 After its release, the B12 combines with the intrinsic factor, a substance released by the stomach cells, and is then absorbed into the bloodstream. We need vitamin B12 for several vital body functions. It is involved in the metabolism of every cell in the body. The vitamin B12 combines with the folate in the formation of DNA, the genetic material in all cells. It is not only needed for the synthesis and regulation of the fatty acids, its needed for energy production also. B12 helps in maintaining the health of the nerve cell and the nervous system. The vitamin B12 is also needed for the synthesis of the red blood cells. It has been found to be very much needed for the growth and development of children. Mainly synthesized by bacteria, vitamin B12 is found primarily in animal products like dairy products, eggs, meat and fish. Though certain plant sources have been identified, like seaweeds and algae, the B12 found in plants are unavailable for human consumption and digestion. The vegetarians need not lose heart, as a variety of fortified foods have been developed which meet the dietary requirements. Since the vitamin B12 is involved in vital body functions, its deficiency could cause irreversible and severe damage. The brain and nervous system are very vulnerable to even deficiency of small amounts, with symptoms like fatigue, depression and poor memory. B12 deficiency can cause pernicious anemia, an autoimmune disease which destroys the parietal cells in the stomach that release the intrinsic factor, or IF. Lack of the IF can result in the inability to absorb B12 from the intestinal tract, causing further deficiency. Deficiency of B12 or folate can lead to megaloblastic anemia, or the poor synthesis of DNA. Along with folate and B6, B12 helps in homocysteine metabolism which can help prevent cardiovascular diseases. Anyone with imbalanced food intake is at risk. But, those who suffer from pernicious anemia, post surgical malabsorption or dietary deficiency are at greater risk. Elderly patients and pregnant and lactating mothers who follow vegetarian diets need to supplement their diets with either supplements or B12 rich diets. Most of the symptoms may occur without anemia, so an early detection of the deficiency can help restrict the irreparable damage it could otherwise cause. The human body needs 2 to 3 micrograms per day for an adult. If taken within dietary allowances, it is safe for use daily.